For me at least, I find that Thai food in general can be pricey. Generally, in terms of each individual item, it may not necessarily break the bank; but the portions are hopelessly small. Therefore, much like tapas, we end up ordering a whole lot of dishes to feed our hunger. Eventually, you get the bill and do a double-take. Of course, many Thai dishes are quite saucy, especially the curries; thus we get full on the rice alone (much like eating pasta). However, it's those times that you want a bit of variety and end up ordering 6 dishes for 3 people where it becomes expensive. 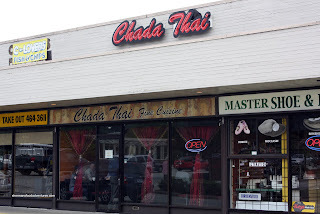 On the topic of expensive, Chada Thai in Coquitlam is definitely n ot cheap eats ($15.00+ per entree). So, to get a taste of Chada Thai without forking over fine dining money, Pomegranate and I went for lunch. Yes, for once Rachel Ray is right. One of her "tips" is to visit a restaurant for lunch since the prices are usually cheaper. Yum-O! 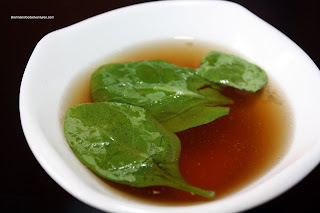 Gawd, I can't believe I just said that... Anyways, even before we ordered, our server brought us a Vegetable Consume with basil. A tad on the salty side, this consume was packed with flavour and aroma. A nice, unexpected start to our meal. 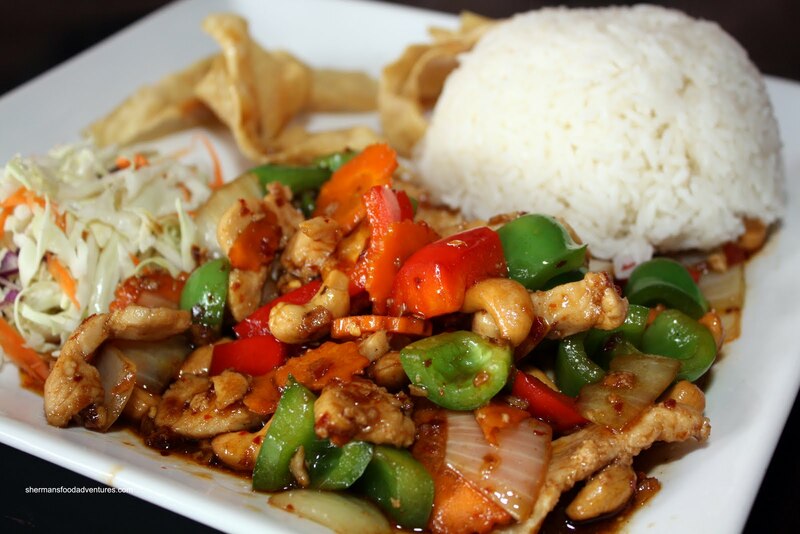 Although not exactly killer cheap (such as Lhy Thai), the lunch specials here are $10.00. Included is the aforementioned soup, rice, salad (more like coleslaw without the dressing) and crispy wraps. Pomegranate went for the Cashew Chicken with medium spice. Interestingly, the medium was actually spicy (not killer spicy, but it had heat). However, the spice didn't detract from the other flavours. A solid dish. 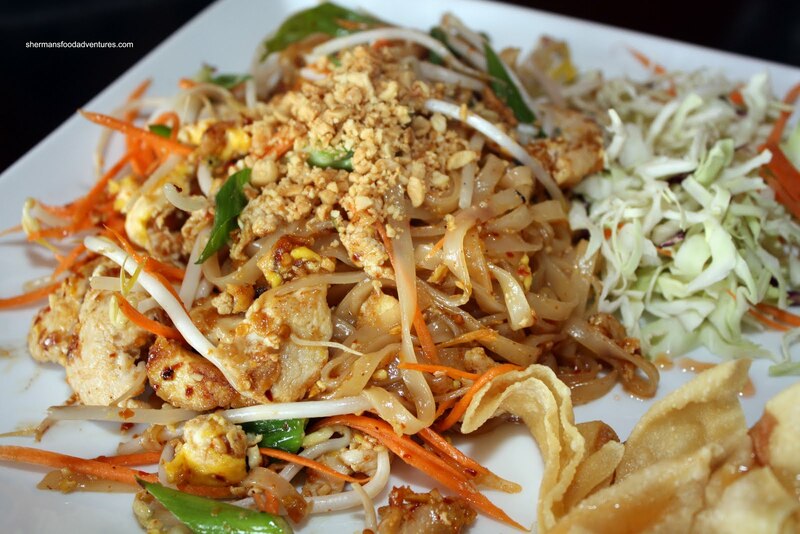 For myself, I had the Pad Thai in the spiciest they could make it. I'm happy to report that it was indeed spicy. Although it numbed both my lips and tongue, believe it or not, it didn't overpower the dish. In between the stinging, I could still taste the tart tamarind and some sweetness. For me, that is the perfect balance for a spicy dish. Furthermore, the noodles were still a bit chewy and there wasn't too much sauce. I know we only had 2 dishes for lunch; but it was enough for me to plan my return visit to Chada Thai. For me, the food quality and flavours were excellent. Execution was spot on and even the medium had a good amount of spice. No watered down flavours here. Kim, I sure will. Dunno when, but I will! justpattiez, the Pad Thai was good and very spicy. Just the way I like it! 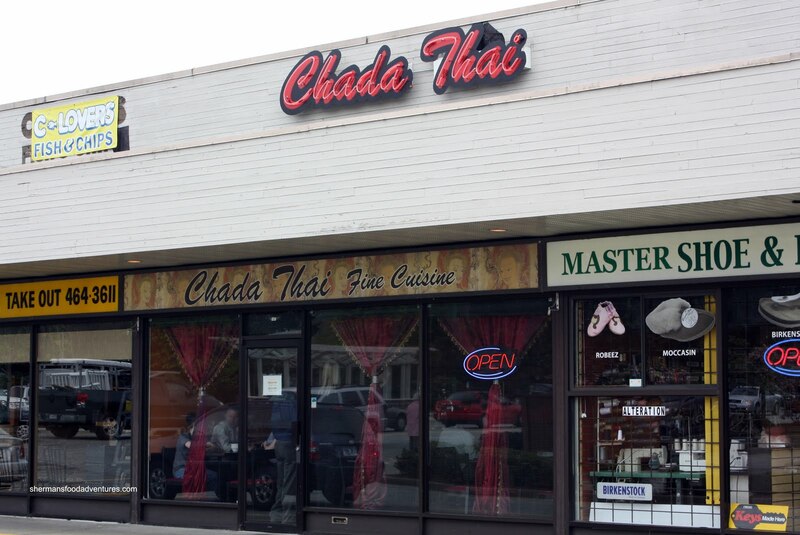 Hi, I had earlier recommended Chada Thai to you. I went last night with my wife, and while our first courses were very good, we had thought they were better in other visits. We had the Thai Beef Salad and the Tom Yum Soup. Both seemed a bit out of balance. Our mains were disappointing, but part of that is what we ordered. I did some research when I got home, and found that sadly the original chef, Brian Marchesi, had passed away in late 2009. He was just short of 32 years old. A nice fellow, I met him once or twice. Actually, I heard that too. Sad... Yah, even after what you mentioned, the food to me is still better than a lot of other Thai restaurants. I've only been to Chada Thai for lunch and haven't been there since Brian died. He was a purist and would not allow takeouts as it would not be a true representation of his food. Also, he said meals were meant to be enjoyed and savoured. He really believed going out for a meal was an experience. I hope that the quality hasn't deteriorated too much. I'd really like to go and visit them again when I have a chance.